The ultimate high capacity wet-sump oil pan for the BMW S14. The Megasump! Extra capacity, greater baffling, and the overall ability to keep more oil at the oil-pump pickup at all times. This oil pan is crucial to those who track their E30 M3's hard! We have seen this pan save our customers engines many times, even on the street! The greater oil capacity helps keep temps down and engines going, and can help get you a few extra seconds to limp to the pits in the event of a direct blow to the pan from debris or bottoming out. Our Megasump insures that as your car pulls high Gs in a corner; oil is kept from pulling away from the engines oil pickup, even during race use on race compound tires. Full Aluminum plate design is now more useful than ever. Super light weight, easy to tap for sensors, and durable. New design is resistant to leaking and has much better flexibility for installs than other styles and much more durable that cast designs. This is the highest performance you can achieve from an S14 with a wet-sump oil system. 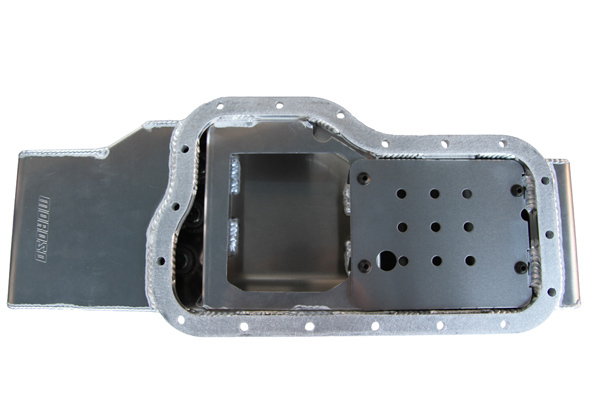 Fits All E30 M3 and 320is (s14 in E30 chassis) - for others, see Hybrid Megasump below. NOTE: *Not for use with Air condition equipped S14s. From Jody Justice of Flat Rock, North Carolina on 9/2/2014 . Don't Track Your S14 Without It! From Tim Leithead of Philadelphia, Pennsylvania on 8/17/2010 .